The benchmarks of SSDs like the Intel 750 suggest speeds approaching those of RAM-Disks. The problem of course is, does this have that much value for consumers, who mostly do read-heavy applications (probably the most important benchmark then would be the Read @ 4k, probably at queue depths of 1 and 2. The big advantage I see is mostly in the field of sequential benchmarks, where we have seen huge leaps in terms of performance. Boot speed and "application smoothness" don't seem to be improving that much. It's mostly storage intensive stuff that sees the benefit, although I suppose if it's super write intensive, then an SLC SSD or perhaps a RAM Disk is still needed. Yeah if you do heavy I/O applications like a database, that gets tons of request and hit a plus 16 Queue Depth, then yes this SSD dose wonders. 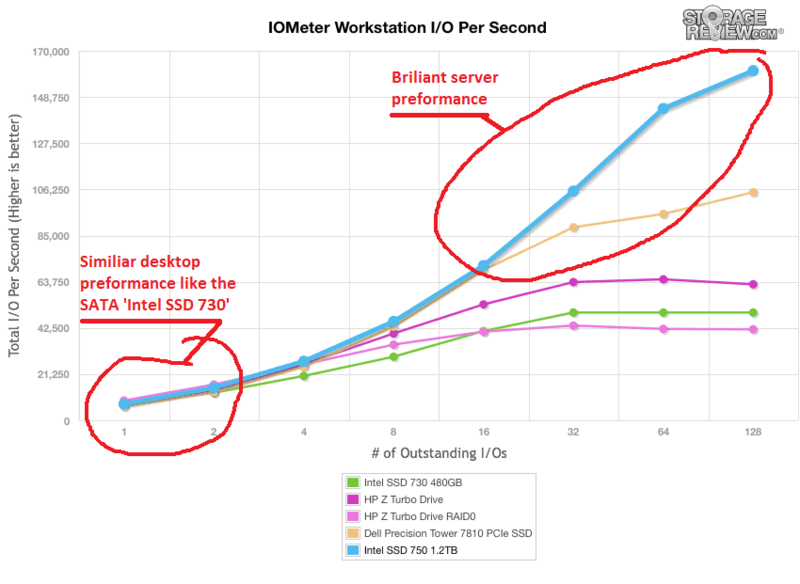 But, in real word desktop usage, with a QD1 ~ QD2, the Intel SSD 750, preforms marginal better then a good SATA SSD, the reason is that NVMe dose not, and can not change anything about the access time of NAND, tho it dose reduce interface latency. 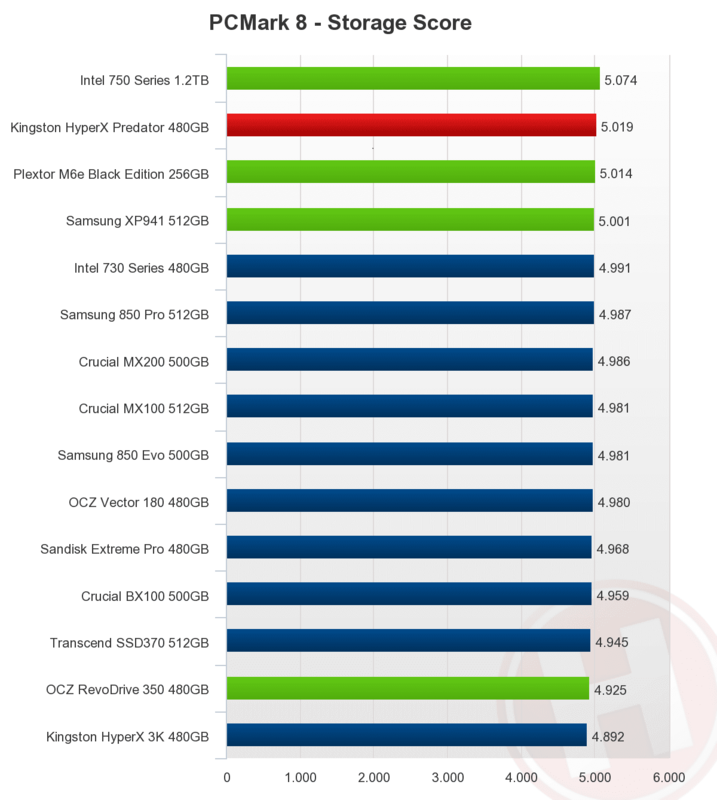 Me, for now, i keep my money in my pocket, till NVMe drives hit 850 Pro prizes, as you can see, the 750 is only 1% faster in the PCMark 8 benchmark, that benchmark simulates imho the best realworld desktop gaming we use. Hopefully we'll see more NVMe drives. Computex showed a couple, but nothing widespread. I was hoping to see Samsung, Micron, etc prepare some more mainstream 750-like drives. Indeed, and as I'm finding, sometimes even SATA 6G drives perform no better than on a 3G interface doing sequential reads or writes with small I/O units and QD1. By this logic, something like the 850 Pro is probably the best we can do really. Actually in day to day use, you probably will not notice the difference between say an 850 Pro and a MX100. Short of heavy workloads, you probably won't notice a difference, no. I still use a pair of 830's on a 3G interface, and the only time it's noticeably slow is when resyncing RAIDs or copying 10GB+ files. However, in my server where it's used as a read cache, there's a huge difference between MX100's and 850 Evo drives, let alone the Pros. That said, even a fairly slow MX100 reduces the time taken for some disk operations from 50 minutes to 50 seconds, but from a purely RAM cache it only takes 5 seconds. I'd imagine servers which are handling these kinds of workloads constantly are where these NVMe drives come into their own. For me, saving 50 seconds twice a day doesn't really justify the cost. I personally believe it does, but it's going to be more of an incremental or a long term thing at this point, rather than an immediate benefit for desktop users. Much like the shift from SATA 1.5Gbps to 3.0Gbps to 6.0Gbps, the immediate benefit is small, longer-term it will make sense. Yet another option may be to use a PCI-E SSD as a "cache" drive. Of course, the merits of this should be compared to say, a RAM cache disk. The NVMe SSD will be cheaper per GB, but slower (speed and latency wise). An uninterpretable power supply is probably a good investment for such a setup.